"It's more than just the coffee we serve...it's the experience we provide." We steep (er, percolate?) our employees in this idea from the very beginning of training--that's the seventh sentence in the training manual, in fact. But it's not compensating. We know our drinks are awesome. But it's just not as much fun if we're only keyed in to making the world's best coffee. 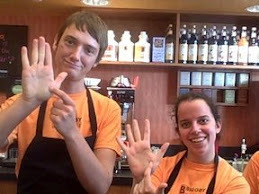 If that was all there was to it, we'd just be BIGGBY Bots. Boring BIGGBY Bots. Bunches of boring BIGGBY Bots. Bunches of boring BIGGBY barista Bots. Bunches of boring BIGGBY Barista Bots belting Badly Drawn Boy's ballads. My wife just told me I took that one too far. Oh well. Can't win 'em all. Anyway, it's fun to take it beyond the coffee. That's what I looked forward to back in my barista days--talking to the customers--regulars or first-time visitors, didn't matter, learning and laughing all the way through each shift. And it's gotta' be the same way for our customers, right? We hear from them all the time via our B-Heard page on our website, where nearly every compliment mentions some variation of great service, fun staff, and so on, and then "oh yeah, love the coffee too." We actually have an entire hallway decorated with these comments! I'll post a video of the hallway, and a micro-tour of the Training Center tomorrow evening, along with a customer comment that I received 5 years ago that I have used in almost every class I've taught since. It's from a great guy named Jim, a long-time regular customer at one of our East Lansing stores, someone who really knows his espresso, and someone who really "gets" what BIGGBY is all about. 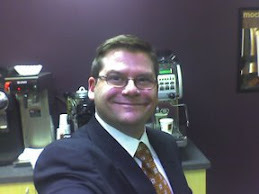 -JD, Director of Training and guest blogger. I see two people at work that used to be customers of mine in my barista days and can still tell you (about 10 years later) their drinks. For the record, they are a grande Big Chill and a short, skim, Mocha, no whip. Great guest blogger, cleaver with a phrase but then he did receive a great education!